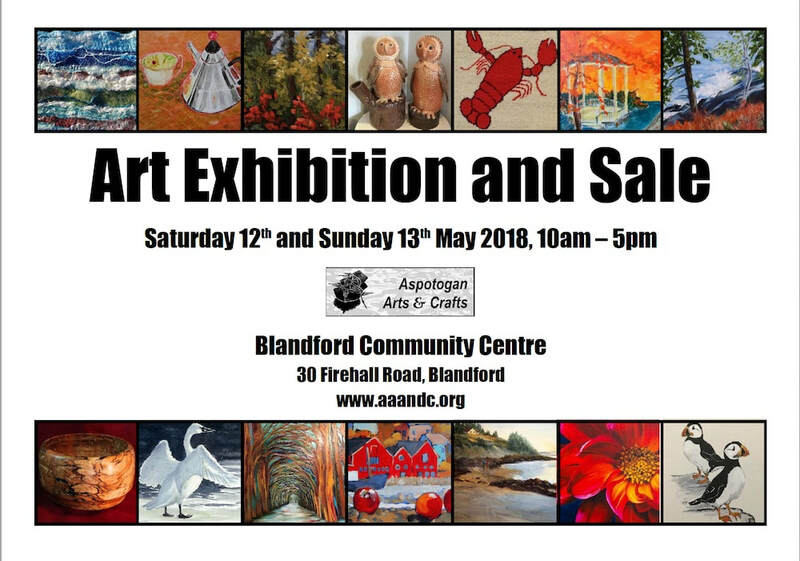 ​Join us for our Annual Spring Exhibition and Sale at the Blandford Community Centre. Each year we get a great turn out to this much-loved, popular show and sale with art demonstrations and refreshments!! We are looking forward to our Annual Art Exhibition and Sale on May, 12-13th, 2018. Please drop in to view all the artworks, chat with the artists who are working the show, and enjoy a refreshment. Our poster show below has all the details. The Aspotogan Arts and Crafts Organization are pleased to attend the Hubbards Barn Farmer's Market every second Saturday, beginning mid-day. The Hubbards Barn Farmer's Market takes place at the Hubbards Barn every Saturday from 8am-12pm from the first Saturday in May to the last Saturday in October every year. Aside from our paintings, ceramics and fibre art, at the market you'll find over 40 local food producers and arts and craft vendors, live music and refreshments. It's a real social event! ​Each year our members participate in the Peggy's Cove Area Festival of the Arts Studio Tour, hosting a show and sale at the Ocean Swells Community Hall in Northwest Cove. Artists are there to greet you between 10am-5pm each day. Annual Fall Show and Sale! Our annual show and sale at the Trellis Cafe in Hubbards. Each Fall, usually in October, members are invited to showcase their paintings on the wall of this lively local restaurant in Hubbards - the Hub of the Aspotogan. ​AA&C recently held a Golden Workshop with Golden artist representative Andrea Warren. The workshop centered around collage and image transfer using the numerous Golden paints and mediums to create interesting effects on their pieces.